PT Pembangunan Perumahan (Persero) Tbk - PT PP or referred to as "PT PP (Persero) Tbk" is a long standing Indonesian general construction company and is majority owned by the Government of Indonesia. At present, 51% of its shares are held by the Government of Indonesia, 4.01% by PP Employees Shareholders Cooperative (KKPSPP), and 44.99%. remaining shares by investor and public shareholders. 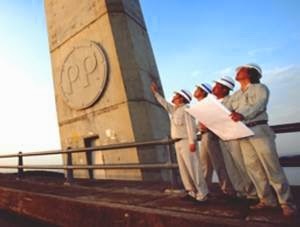 PT PP (Persero) Tbk shares a rich history in construction of prestigious building, infrastructure, property and EPC that reaches back over 60 years. PT PP (Persero) Tbk was founded in 1953 as a limited liability company under the Notarial Deed No 48 of 26 August 1953 and originally registered under the name of NV Pembangunan Perumahan. In 1960, NV Pembangunan Perumahan renamed into PN Pembangunan Perumahan. The name of PT Pembangunan Perumahan (Persero) officially launched in 1971 under the Government Regulation No. 39 year 1971. In 2010, the Company conducted its initial public offering (IPO) on the Indonesia Stock Exchange (IDX) and its shares are traded under reference of “PTPP”. PT PP (Persero) Tbk is based in Jakarta and now has 5 key subsidiary companies; PT PP Dirganeka (99.999% owned by PTPP), PT PP Pracetak (99.999%), PT Gitanusa Sarana Niaga (99.99%), PT PP Alkon (99.98%), and PT PP Properti Tbk (99.9%). Achievement and performance of PT PP (Persero) Tbk in the third quarter of 2015 (Q3 2015, ended in 30 September 2015) shows good results achievement. According to PT PP (Persero) Tbk - Financial Highlight as cited by JobsCDC.com, PT PP (Persero) Tbk registered total total operating revenue in Q3 2015 amounted to Rp 8,774.67 billion, a 12.39% growth as compared with Rp 7,807.54 billion in the same period previous year. Total comprehensive profit in Q3 2015 amounted to Rp 445.82 billion. These total comprehensive profit figures equivalent with a 59.59% growth as compared with Rp 279.36 in Q3 2014. S1 graduate of Psychology or Management from a state/leading universities. Male, not more than 26 years old. Fresh graduate, or work experience less than 1 year. A minimum final GPA of 3.00. TOEFL / TOEFL Prediction Score at least 450. Have a good understanding about the structure and performance of human resources. Neat, communicative and hard work is more preferable. Willing to be placed throughout the area of operations of PT PP (Persero) Tbk, especially in Operations Division IV (Makassar). JobsCDC.com now available on android device. Download now on Google Play here. Please be aware of recruitment fraud. The entire stage of this selection process is free of charge. PT PP (Persero) Tbk - Fresh Graduate Management Regular Program PT PP February 2016 will never ask for fees or upfront payments for any purposes during the recruitment process such as transportation and accommodation.